Here are two stocks that could produce strong returns and still allow you to sleep at night. With the market at record highs and the uncertainty that comes with the incoming Trump administration, it is more important than ever to find risk-adverse investments that work in all economic climates. One of the best ways to mitigate risk, while still setting yourself up for long-term gains, is to consider high-quality real estate investment trusts like these two for your portfolio. 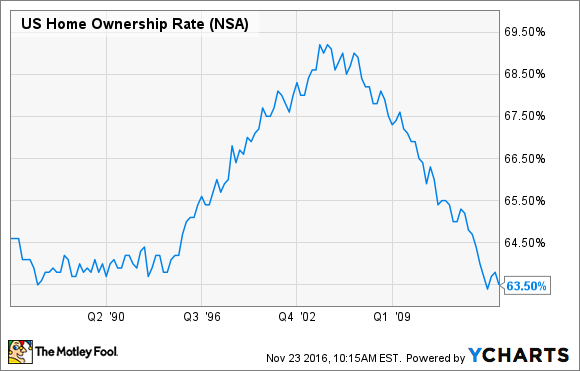 The U.S. homeownership rate is at a generational low, and that makes it a good time to be a landlord. A great way to capitalize on this trend is with AvalonBay Communities (NYSE:AVB), which is trading at a fresh 52-week low mainly due to interest rate fears. AvalonBay owns 282 apartment communities, most of which are concentrated in core markets such as San Francisco, New York City, and Washington, D.C. These are places with strong population growth, homeownership costs that are prohibitively expensive for many people, and high barriers to entry for competitors. In other words, lots of people in places like New York City need apartments, but it's not so easy for just anyone to come in and build a new apartment building there. AvalonBay's main strategy is to grow through development, and the company currently has $2.7 billion worth of properties under construction. While development is a bit riskier than simply acquiring existing properties, it does have the potential for much higher returns. To illustrate this point, let's say that you could buy a property for $10 million in one of AvalonBay's core markets and generate $700,000 in net income per year, a yield of 7% on your investments. Or, you could build a similar property at a cost of just $8 million and still generate the same amount of rent -- an effective yield of 8.8%. While AvalonBay isn't completely recession-proof -- in tough times, apartment vacancy rates could rise -- as an industry leader that focuses in high-barrier markets, it should fare better than its competitors in the event of a recession. National Retail Properties (NYSE:NNN) is a pure play on freestanding net-lease retail, and has shed 14% of its value since August. With a reasonable P/FFO valuation of 17.6 -- significantly lower than industry-leading Realty Income (NYSE:O) -- now may be a great time to get in on this 4.4% yielder that has a 27-year track record of dividend increases and strong performance. Non-discretionary retail -- Top tenants include Sunoco and 7-Eleven. These businesses sell items people need, making them recession-resistant. In tough times, people can cut back on high-end clothing and entertainment. However, they'll still need to put gas in their car and food on the table. Service-based retail -- These are businesses that people have to physically go to. Examples among National Retail's top tenants are Mister Car Wash and LA Fitness, as well as restaurants such as Taco Bell and Bob Evans. These types of businesses are immune to online competition, a big thorn in the side of many discretionary retailers. Low-price retail -- BJs Wholesale Club is a good example of this. These businesses offer discounts even the top online retailers generally can't match. They actually tend to do better during recessions. In addition, National Retail Properties' lease structure is another thing that makes the company low-risk. Tenants sign net leases with 15 year to 20 year initial terms, which minimizes turnover. In fact, the company's properties are currently 99% occupied. In addition, a net lease requires the tenant to pay variable costs such as property taxes, building insurance, and maintenance. National Retail Properties simply finds a tenant and collects a steadily increasing monthly rent check for years. To be perfectly clear, these stocks are low-risk. They are resistant to recessions and are among the largest players in their respective industries. However, low-risk doesn't mean risk-free. There are several reasons these stocks could go down. Interest rate risk is a big one, and is actually the main reason these REITs have declined over the past few months. As an example of an industry-specific risk for AvalonBay, a surge in first-time homebuyers could cause demand for high-end apartments to plunge. Or, one of National Retail Properties' major tenants could go bankrupt. I don't view any of these company-specific threats as probable, and anything that does happen is likely to be a short-term hiccup, not a long-term game changer. Still, it's important to make the distinction. I'm not saying that these stocks will go straight up. Rather, I'm saying that you can buy them with a long-term mentality and sleep soundly at night.